THE ZOOTS are Coming! And They're Bringing the Sounds of the Sixties! 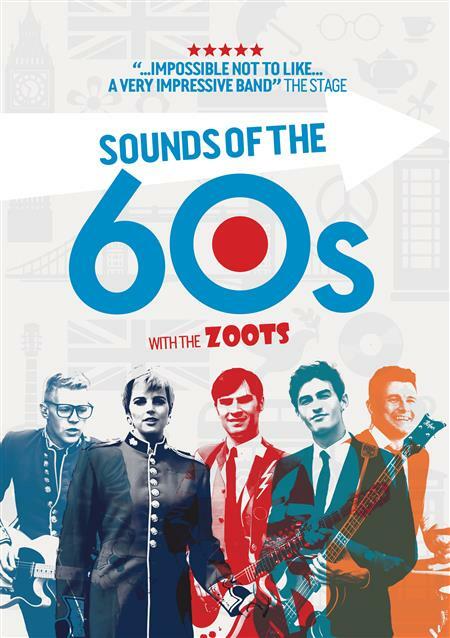 Experience THE Sixties show that's wowing audiences around the world, selling out and headlining venues from the Palladium to Old Trafford - with the spectacular sounds of THE ZOOTS! Jamie is the dishy lead singer - but don't be fooled by his dreamy looks! Jamie has performed on the same bill as Gerry and the Pacemakers and The Searchers, making him the real deal. Harriet’s a real cool chick with red hot hair - and energy to match! She taps out neat percussive beats & sings sweet backing vocals. Adam doesn't play guitar - he makes it sing, daddy-o! His playing is so hip, even your gran will want to Twist and Shout! Tommy is a maestro with the bassline. He pops, picks and plucks the rhythm that keeps THE ZOOTS so tight and sharp! Ian plays the drums, and lays the beat behind the hits! He makes that drum kit shake, rattle and roll - and how!